The U.S. Census has good news about marriage and divorce in America. First, the number of marriages took a big jump from 2,077,000 marriages in 2015 to 2,303,000 in 2016. Second, the number of divorces fell from 1,159,000 in 2015 to only 1,045,000 divorces in 2016. What these numbers mean is that there has been a big one-year drop in the divorce rate - from 53.4% in 2015 to a divorce rate of only 45.3%. However, for four decades - since 1975 - there has been one divorce for every two marriages in America. Even with the good news of more marriages and fewer divorces in 2016, there was still about one divorce for every two marriages. The United States has the highest divorce rate in the civilized world. 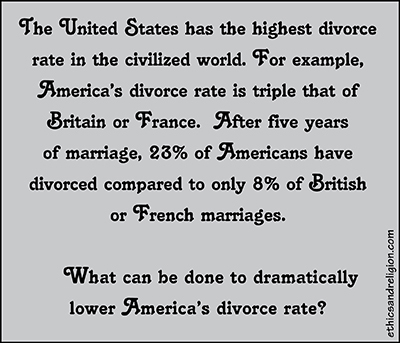 For example, America's divorce rate is triple that of Britain or France. After five years of marriage, 23% of Americans have divorced compared to only 8% of British or French marriages. What can be done to dramatically lower America's divorce rate? About two decades ago, Rev. Richard McGinnis, an Episcopal priest, invented an answer. He called it Marriage Ministry. I'd call it marriage mentoring. One Sunday he asked his congregation in Jacksonville, FL this question: "Are there couples here whose marriages were once on the rocks, but are now in a state of healing? If so, I'd like to meet with you after the service." Out of 180 people in church, 10 couples showed up. He was surprised, expecting only one or two couples. He asked them these questions: "Would you be willing to share what you did - or what did God do - to heal your marriage? Would you be willing to tell your story to these couples?" Seven of the 10 couples agreed to do so. Over the next months, they shared their problem, and what they did to heal their marriage. Their stories were radically different. One woman was in an adulterous affair for seven years that her husband did not know about. A bisexual man went to gay bars on Friday night. An opthamologist had so little work he was doing his own lab work at night. His wife said, "What kind of marriage is this? I never see you!" Yet what was surprising was that all seven couples experienced 17 steps analogous to the 12 steps of Alcoholics Anonymous. The couples called them "17 Action Statements" or 17 M&Ms, Marriage Ministry steps. We made a fearless and searching inventory of ourselves. Through other Christians' testimony and example, we/I found hope for our marriage. I experienced God's love and forgiveness. I made a decision to follow Jesus as my Savior and Lord. I realized that the problem was with myself. I began to look at myself as needing change to be able to love no matter what. I became aware I needed to change, became willing to change, learned what and how to change, and began to change with God's help. Father McGinnis began asking couples in current crisis to meet with Mentor Couples who had healed their marriage after a similar crisis. For example a couple who survived adultery could say to a couple in current crisis over infidelity: "This is what we did to restore trust." That's exactly what the troubled couple needed to hear. By contrast, most pastors send couples in troubled marriage to counselors. That is a big mistake. A book called Covenant Marriage warns that "Couples who receive marital counseling (during marriage) are substantially more likely to divorce than couples who forego this option. All forms of marital counseling are associated with a two- to threefold increase in the likelihood of divorce." Why does counseling increase the odds of divorce? Counselors make money every time a couple or a spouse comes for help. If the couple heals their marriage in three sessions, they will not return. But if the couple divorces, one or both spouses who are in pain might come back to the counselor for a year or more. Counselor economics favor divorce over healing. By contrast, over five years, the McGinnis Mentor Couples saved 38 out of 40 crisis marriages - a 95% success rate.